For several years now, my friend and colleague, Chris Brown, and I have been studying the tiger beetles (family Cicindelidae) of Missouri in an attempt to characterize the faunal composition and in-state distributions of the included species. Our studies have relied on examination of specimens in museum collections along with several seasons of field work across the state. The data we’ve gathered so far have revealed a fauna that reflects the ecotonal position of Missouri, comprised of elements from the eastern deciduous forest, the southeastern mixed hardwood forests and pinelands, and the western grasslands. These beetles are most frequently associated with disturbed habitats containing sparse vegetation, such as sandbars and erosion cuts, but they also live in other habitats such as along muddy banks, on glades and in forest litter. 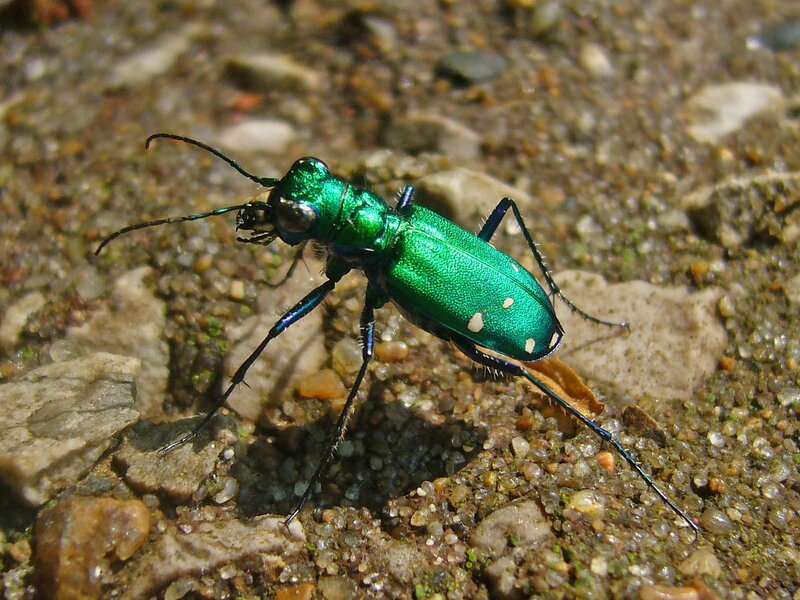 Since European settlement of Missouri, drastic alterations have occurred in the abundance and distribution of these habitats across the state, and tiger beetle populations have been affected as a result. Dredging and straightening of natural water courses have impacted species that prefer the water’s edge, while fire suppression has impacted those that need dry, open habitats. Grazing has had a profound impact on species associated with sensitive, saline habitats. Conversely, some anthropogenic changes have benefited certain species – road, borrow sand pit and pond construction have increased habitat for species able to utilize such habitats. To date, our surveys have confirmed the presence of 23 species in Missouri (16% of the North American fauna). Some species are common and widespread, such as Cicindela sexguttata (six-spotted tiger beetle) (above, photo taken in a mature white oak forest in Warren Co.). Others have more specific habitat requirements, but their status within the state remains secure. A few are rare and highly localized, primarily representing species at or near the northern or western edge of their distributions that exist in the state as small, disjunct populations. Special conservation efforts may be warrented for these to ensure their continued survival within the state. One species of potential conservation concern is C. pruinina (loamy-ground tiger beetle), a grassland species normally found in Kansas, Oklahoma, and Texas (left, photo by Chris Brown). This beetle is sometimes treated as a synonym or subspecies of C. belfragei but was most recently considered a valid species by Spomer et al. (2008). When we began our studies, the species was known from Missouri only by a small series of specimens collected in one of the western counties and deposited in the collection of Ron Huber. An additional specimen in the Huber collection labeled “Columbia, Mo.” is considered to likely represent student mislabeling. Several attempts at relocating the western Missouri population were required before we found it, and intensive surveys to determine the extent of its distribution in Missouri were conducted during 2006 using a combination of pitfall traps and direct observation. Those surveys succeeded in detecting the beetle only along one 2.5-mile stretch of county road in Johnson Co. The beetle seems to be restricted to red clay embankments occurring in a small localized area of the county. This season we plan to refine our survey by focusing tightly on promising habitats in this area near the sites identified in 2006 to more precisely define the distributional limits of this population. Regardless of what we find, the flightless nature of the species, its highly localized Missouri occurrence, and the disjunct nature of such suggest that special conservation status is warranted for the species to ensure its continued presence in the state. Despite the relatively low numbers of individuals we have seen, the protected status of the land on which this beetle lives leaves us optimistic about its future. A Missouri species about which we are far less optimistic is C. circumpicta johnsonii (saline springs tiger beetle) (right, photo by Chris Brown), long known from saline spring habitats in the central part of the state. The Missouri population is highly disjunct from the main population further west and exhibits a uniform blue-green coloration rather than the mix of blue, green, and red colors exhibited by the main population. These features suggest that separate subspecies status might be warranted for the Missouri population. Numerous historical collection records exist from a handful of sites in Howard and Cooper Counties; however, surveys conducted by us during recent years revealed that the populations had suffered severe declines. This appears to be largely due to cattle disturbance and vegetational encroachment of the sensitive saline spring habitats upon which the beetle depends, especially at sites located on private land. Ron Huber, in a letter to me listing the collecting records he had for this species, reported seeing “hundreds of the wary little buggers” at one locality on private land, but in our visit to the site not a single individual was seen around the spring – badly trampled and overgrown with the exotic pasture grass tall fescue (Festuca arundinacea). In all, we were successful in finding the beetle at only one of the historical localities and at one new site located nearby. While both of these sites are located on state protected land, we concluded that the longterm viability of the C. circumpicta johnsonii population in Missouri was in serious jeopardy. Based on our recommendation, the species was placed on the Missouri Species of Conservation Concern Checklist with a ranking of S1 (critically emperiled). While this affords the species legal protection under the Wildlife Code of Missouri, the benefit may be minimal since the Wildlife Code does not address the main threat to this beetle’s survival – habitat degradation. We have not surveyed for this beetle since but plan to make field observations this summer (no trapping!) to check on its status. I sincerely hope we will not have to hang our heads with the realization that we have succeeded in extirpating yet another beautiful and irreplaceable gem. Last year we finally succeeded in locating C. cursitans (ant-like tiger beetle) in Missouri (left, photo by Chris Brown). Adults are flightless, and at less than 1 cm in length, are among the smallest of North American tiger beetles. The species has been recorded broadly but sporadically between the Appalachians and Great Plains – a distribution that is probably underestimated due to its small size and general resemblance to ants. A significant distributional gap exists between the eastern and Great Plains records, which Ron Huber believes may be indicative of two disjunct forms and potentially two species. Missouri falls within this gap, and although the species has not yet been formally recorded from the state, a single specimen collected in 1991 “nr. Portageville” is deposited in the Enns Entomology Museum, University of Missouri, Columbia. 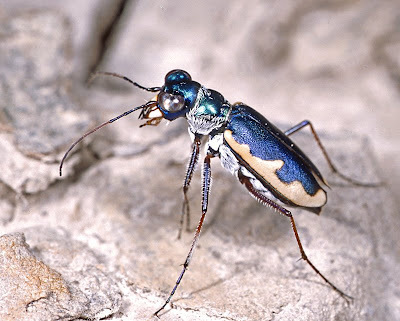 We had made several attempts over the past few years to locate this species by searching what we thought were promising habitats along the Mississippi River near Portageville, but the species was not located until last year, when I relayed this information to Portageville biologist and tiger beetle enthusiast Kent Fothergill. Kent not only located the beetle at the location I suggested, but quickly found another population on a nearby parcel of land managed by the Missouri Department of Conservation. Hurriedly, we visited the first site and observed a few additional individuals at a nearby location just to the south. The bottomland forest habitat within which all of these individuals were observed is fairly extensive along the Mississippi River in the southeastern lowlands of Missouri, but at this point we can only speculate whether C. cursitans occurs throughout this habitat. Other habitats have been reported for this species, including mesic and wet prairies and meadows (Brust et al. 2005). Such habitats are also found in the southeastern lowlands, and while C. cursitans has not been seen through cursory examinations in such areas, it is possible that the small size, cryptic habits, and narrow temporal occurrence of C. cursitans have allowed it to escape detection. Kent will be helping us this season with additional trapping and direct observation at several selected sites along the Mississippi and St. Francois Rivers to determine whether the beetle occurs more broadly in the southeastern lowlands and whether it utilizes these other habitats in addition to bottomland forests. I would be most interested in any additional reports of these rare tiger beetles in Missouri (contact me at the email address shown in the left sidebar copyright statement). Remember, C. circumpicta johnsonii is critically emperiled in Missouri – please do not collect it. This entry was posted in Cicindelidae, Coleoptera and tagged beetles, conservation, entomology, insects, Missouri, nature, science, taxonomy, tiger beetles. Bookmark the permalink. Another outstanding post. I have always loved Tigers since I was a kid growing up in East Texas. They are a delight to watch, with their agility and many times unapproachable nature. To me they are the “dragonfly” of the beetle world. Thanks for posting large-sized photos of the Tigers. It’s a joy to see them up-close and personal. I like your sidebar photo. Big Bend is a favorite destination. Thanks for the fine links that you provide. I assume you noticed that you are on my “Nature Blogs” blog roll. I enjoyed your article in ‘Missouri Conservationist Online’. Thanks for the recent visit and keep up the great work on conservation and education efforts concerning Tiger Beetles. So are they leaving Cicindellidae out of Carabidae. Last time I was visiting my old school, I heard that it had been put back in. I’m not in school any more, just a stay at home mom, so I can’t hope to keep up. Troy and Allison – two of my favorite bloggers! Thanks for all your kind comments. Amy – the question isn’t settled. Mitochondrial DNA studies suggest they should be included with Carabidae, but passions run deep. I prefer to keep them separate because of their highly divergent larval morphology and specialized life history. It’s analogous to humans as a separate family/subfamily versus the remaining anthropoid apes – DNA evidence says one thing, common sense says something else. Great Photos! I never manage to get a shot before they speed off. I just realized you aren’t in my blogroll! Must fix that! Thanks for stopping by my blog. I really enjoyed your posting. This is a really great blog! Tiger beetles are a relatively recent passion of mine, but I’m now a total addict. I’ll be at Wilcox Playa in AZ in 3 weeks. I’m in awe of your photography skills. Isn’t that the truth! Ornithology has had the same types of debates over molecular DNA vs. morphology.